Nutanix (NASDAQ:NTNX) outpaced the market by gaining 15% last month compared to a 3% increase in the S&P 500, according to data provided by S&P Global Market Intelligence. The rally kept the cloud networking services provider's shares well ahead of the broader market so far this year -- up more than 40%. 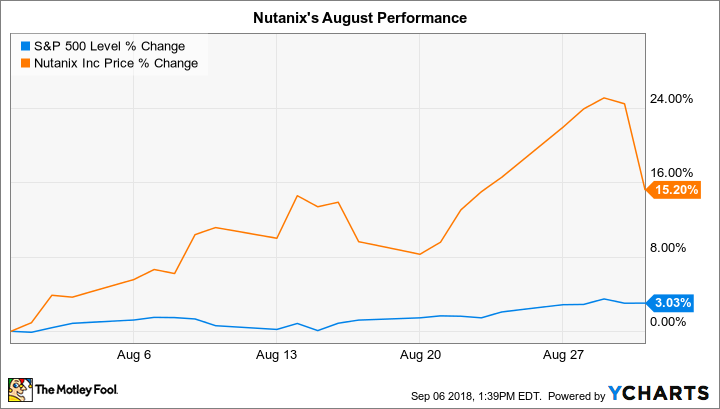 Investors pushed Nutanix stock higher last month in anticipation of a strong quarterly earnings report. And late in the month, the company largely delivered on those high expectations. Sales rose 20% thanks to healthy growth in billings and in its broader customer base for cloud services. These gains more than offset sharp declines in hardware sales. The shift toward the software business also helped profitability spike, with gross margin jumping by 14.5 percentage points to a record 76% of sales. Hardware still represents about 10% of the business, which gives Nutanix more room for margin expansion ahead as software continues to displace that segment. In fact, executives are targeting gross margin of between 78% and 79% for the current quarter. Revenue should land between $295 million and $310 million, translating into software gains of between 40% and 45%. The sales acceleration is predicted to hold up, too, with billings growth rising to more than 50% from 49% in the most recent quarter.